What were those 2 robbers doing being crucified either side of Jesus? 39 But one of the hung evildoers began to say abusively to him: You are the Christ, are you not? Save yourself and us. 41 And we, indeed, justly so, for we are receiving in full what we deserve for things we did; but this [man] did nothing out of the way. 42 And he went on to say: Jesus, remember me when you get into your kingdom. What really is this stage managed crucifixion scene as worded in Luke saying to mankind? And what are these two bit part actors doing at the climax of our salvation? Why did God permit them into his son's big scene? How did they manage to get almost equal billing with the Christ in the poster campaign for all Christianity? Well they are declaring that the evildoer/sinner with faith will be with Jesus in paradise but the evildoer/sinner without faith will not. Furthermore 50% of those who go into the first death as Jesus did will put faith in the kingdom and be saved, and 50% who go into the first death as Jesus did will be abusive to the kingdom and not be with him in paradise but be in Gehenna. Because God could have easily had 23 people crucified on his son's left and 47 on his right, but he chose one on each side, declaring through this choice that as many will be with Jesus in paradise, in the kingdom on earth as will not. So the crucifixion scene represents all of mankind together with their saviour split into the sheep on the one hand and the goats on the other. But interestingly for the more technically minded reader, there is no stated handedness here. We do not know which evildoer was on which side of the Christ. In the parable of the sheep and the goats, it does not say those on the right go into indefinite life and those on the left go into indefinite reproach. It says the righteous ones go into indefinite life and the others into indefinite cutting off. Note that at no time did Jesus ask either of the condemned sinners: What capital sin did you commit my dear fellow? The sin, however large, and in both cases judged to be a capital sin by the Roman state, was irrelevant to salvation. The two men did not differ at all in sin, they differed only in faith. But there is much more here. For instance, no man goes into everlasting cutting off because even the abusive evildoer dies at the side of Jesus which is telling us that he is also saved by Jesus' blood eventually. (The Greek word is aiwnion in the parable of the sheep sand the goats in Matthew 25 means indefinitely lasting or everlasting). So the crucifixion scene is telling us Jesus' sacrifice saves all of mankind even the abusive sinners. But not all of us will be with him in paradise. The crucial realisation here is that the abusive sinner who represents those who go to hell was no farther away from Jesus' blood than the faithful sinner who represents those who go into the paradise. So the eventual salvation of the faithless sinner is just as secure as it is for the faithful sinner. Furthermore since Jesus, the faithful sinner and the abusive sinner are all in the same judgement (verse 40). 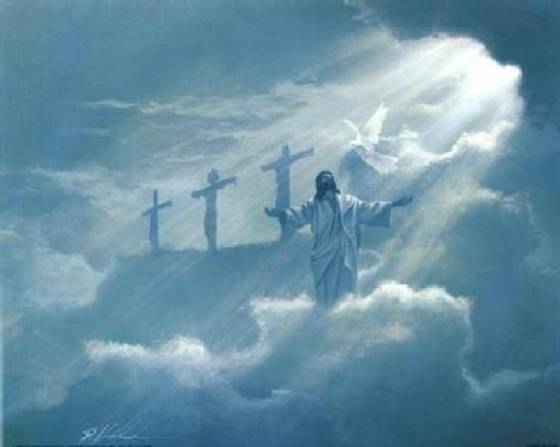 So they are all resurrected, they all get everlasting life, and they all become Gods eventually. And all of this is through the blood of Jesus (actually of his everlasting angelic body). This is because God loves the abusive sinner as much as he loves his firstborn son Jesus Christ. And he will not give up on any of us just as most human fathers will not give up on any of their sons. Now we cannot resist the observation that those with faith see the purpose and value of Jesus' death as crucifact, whereas those without see it as crucifiction! The abusive evildoer knew Jesus was going to die but attached no significance to it. The faithful evildoer realized that a kingdom would result from it. Many LWs in the early days wondered why does this church have such a motley crew as its congregation? The answer is that God is teaching us to love all of our brothers, not just the regular variety. So yes dear reader, however bad your sin and however abusive your behaviour and however small your faith, God and Jesus love you unbreakably and will save you eventually. Now if you want a lesson in what love is - you have just had it! 11 Closely following this he travelled to a city called Nain, and his disciples and a great crowd were travelling with him. 12 As he got near the gate of the city, why, look! there was a dead man being carried out, the only-begotten son of his mother. Besides, she was a widow. A considerable crowd from the city was also with her. 13 And when the Lord caught sight of her, he was moved with pity for her, and he said to her: Stop weeping. 14 With that he approached and touched the bier, and the bearers stood still, and he said: Young man, I say to you, Get up! 15 And the dead man sat up and started to speak, and he gave him to his mother. 16 Now fear seized them all, and they began to glorify God, saying: A great prophet has been raised up among us, and, God has turned his attention to his people (Luke 7). The widow had lost her husband and her only begotten son. She therefore had no means of financial support - she was destitute. Jesus looked at her situation, and resurrected her son on the spot. No questions about faith, because her son was a man and was dead. He must have had faith when he was alive or Jesus could not have resurrected him. This widow was in the worst possible of predicaments and Jesus had one look and took her straight out of that predicament. So this woman who had lost all of her physical security stands for those who have no spiritual security, no faith. She stands for those who fail every test, who miss every salvation covenant. Those who are not the children of Abraham (even though the sons was a son of the 1AC). It is telling us that God's love is so great that he will save even these. They will have to spend a bit of time in Hell first however! In this account the two crucified either side of Jesus are not called robbers or evil doers, but just other men. They stand for the two other men involved in the big salvation plan of God, namely Gabriel and Melchizedek. For Michael is the master mediator of the angelic salvation covenant, Gabriel is the master mediator of the church salvation covenant and Melchizedek is the master mediator of the faith salvation covenant - see U9. 18 and there they impaled him, and 2 other [men] with him, one on this side and one on that, but Jesus in the middle (John 20). So here the 3 impaled men stand for the 3 validation sacrifices in God's plan to save us all. It is a 3 man salvation plan not a 1 man salvation plan - see Intro28, Intro29. In these two gospels Jesus two fellow impalees are referred to as robbers who begin to reproach him. The two in Matthew and the two in Mark together make 4 robbers who pick up their torture stakes as Jesus did. In fact they began as houses of prayer but became caves of robbers. They are the 4 true churches. FDS1 and FDS3 steal the saints from FDS2 and FDS4. FDS4 has a sect in Laodicea which has stolen most of its congregation and presumably a similar thing happened to FDS2. What a terrible job we make of serving God! Even when we are staring the glory of God in the face, all we want is money, status, power the glory of men and the glory of women. So great is our desire for glory and so small is our gratitude for salvation. 38 Then 2 robbers were impaled with him, one on his right and one on his left. 40 and saying: Oh you would-be thrower- down of the temple and builder of it in 3 days, save yourself! If you are a son of God, come down off the torture stake! 42 Others he saved; himself he cannot save! He is King of Israel; let him now come down off the torture stake and we will believe on him. 44 In the same way even the robbers that were impaled together with him began reproaching him (Matthew 27). 27 Moreover, they impaled 2 robbers with him, one on his right and one on his left. 30 save yourself by coming down off the torture stake. 31 In like manner also the chief priests were making fun among themselves with the scribes and saying: Others he saved; himself he cannot save! 32 Let the Christ the King of Israel now come down off the torture stake, that we may see and believe. Even those impaled together with him were reproaching him (Mark 15).